Most of the people living in poverty are children. Poverty denies children their rights. 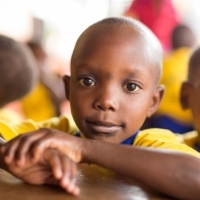 We believe that every child is valuable and has a right to a hope and a future. Abuse and exploitation of children is linked to widespread and deeply entrenched with poverty. It scars their lives with ill health, malnutrition, vulnerability and impaired physical and mental development, and lack of education and oppurtunities. • Spiritual: We are Christ-centred. Every sponsored child hears the gospel and is encouraged to develop a lifelong relationship with God. By being church based, all children sponsored are encouraged to attend a local church. Our hope is that all children know God and follow Him. • Intellectual: All sponsored children are givein a full primary and secondary scholorship which includes full school fees, school uniforms, text books, lunch allowance, and examination fees. • Physical: We ensure that through sponsorship, children are healthy and have access to medical care when needed and have regular health checkups by professional medical staff. • Emotional: Through sponsorship, children have security, hope and purpose. They develop good character, integrity and healthy relationships. To sponsor a child, simply select the child you wish to sponsor, complete the online form and push the submit button. We will then forward an A5 laminated sponsor card of your child to you.